Looking for information on how to dry flowers? Drying flowers is a great way to preserve the look and feel of summer through the cooler months, or to keep a special bouquet a little while longer. Dried flowers are a fun way to decorate your home, especially in the winter months when fresh flowers from the garden aren't available. It's really easy and inexpensive to dry flowers, and it doesn't require any special skills or equipment to air-dry flowers. 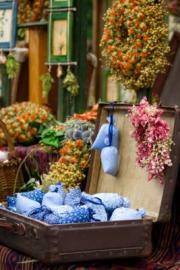 Dried flower arrangements, when made with the right kind of flowers, can last a long time. You can also make potpourri with dried flowers, which will smell much nicer than the stuff you can buy in stores. Flowers will dry with different degrees of success. White and pale colored flowers often discolor during drying. Flowers that are stable and strong-looking in life will hold up well to drying. Dried flowers add a touch of summer to your home. In addition to the flowers themselves, you can also successfully dry leaves, grass and seed heads (left after the flowers have bloomed and gone to seed). Leaves from any tree or plant can be successfully dried, and many ornamental grasses such as fountain grass, plume grass and pampas grass can successfully be dried as well. The most important lesson when learning how to dry flowers is how to pick the best flowers for drying. Sticking to the guidelines above will help you find and grow types flowers that are good for drying, but how do you know which individual blossoms will be most successful? The main thing to keep in mind is that the look of a flower won't improve with drying. If a flower has been attacked by insects, is brown around the edges, or is just shaped strangely, you don't want to choose that one for drying. The ideal flowers have not quite opened completely because they will continue to open as they dry. They will have a nice shape, no discoloration and no signs of disease or infestation. Even when following these guidelines, some flowers will look better dried than others. If you've got a plan that requires a certain amount of specific flowers, make sure you harvest more than you need so all of your flowers will look perfect. The easiest way to dry flowers is to hang a bunch upside down in a dry, dark, somewhat warm location. A closet that people don't enter very often is an ideal place. 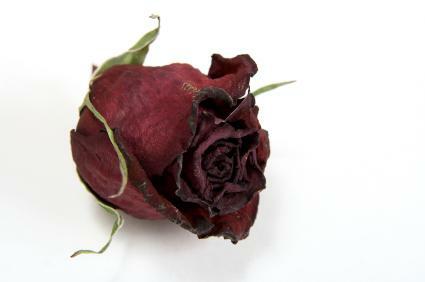 Moisture is a problem when learning how to dry flowers because they can get moldy if left in a damp place for too long. Flowers with fragile stems, like strawflower, should have their stems reinforced with a piece of floral wire before being hung upside down. Flowers hung this way usually take two or three weeks to dry completely. Try not to disturb them during this process. Flowers dried by hanging usually come out with relatively straight stems. You can dry stems into curving shapes by soaking the stems in water until they are pliable and gently curving the stem to the desired shape. Weigh the stem down as it dries, or use a piece of curved cardboard to keep the shape in place. You can also dry flowers with the help of desiccating pellets and your microwave. The pellets are usually made of silica and can be found at your local craft store in the floral section or at a floral supply store. All you have to do is line a microwave-safe container with the pellets and heat for three minutes to ensure the pellets are dry. Then pour the pellets into a glass bowl so that they are about an inch deep. Place flowers with trimmed stems into the bowl so that they are standing up in the pellets. Pour the remaining pellets down over the flowers so that the blooms are completely covered. Heat the bowl for two to five minutes on high, depending on the size of the blooms. Larger blooms will need more heating time. Allow to cool for 20 minutes, and then pour off the crystals. Use a paintbrush or cotton swab to clean the petals so they won't have any desiccant on them. Tape the flowers to florist wire to use in arrangements. The color will be a little darker than the original blooms, but they'll look great.